Yekaterinburg Metro is a solution for getting around the Yekaterinburg city. One of the main problems a traveler’s face while traveling is “How do I get from A to B conveniently as possible?”. Moreover, outside of the inner cities, walking becomes a very slow option. In addition, travelers have to study timetables and maps and try not to get lost. Therefore, the metro station here serves really well as a mean of transportation from Yekaterinburg to other cities in Russia. They’re architectural also quite entertaining for visitors to look into. The 4th largest city of Russia serves a major pillar in the run of Russian affairs, after Moscow and St. Petersburg. It is one of the cities in Russia worth to see, Yekaterinburg metro is the common public transport of the city. The most popular thing about this metro stations is that it serves as a transit for all Trans-Siberian trains. It is a well-known fact in the Siberian. Here are some facts about Yekaterinburg metro. There is only a single line in Yekaterinburg Metro. However, it carries more than 50 million passengers per year and has very impressive stations. All metro stations open between 6:00 and 24:00. It is very punctual with a high rate of accuracy. Metro stations in Yekaterinburg is modern and simple. Moreover, if you compared it with metro stations in Moscow or Saint Petersburg, it is more modest. The architects were able to use different technologies for each station with its very own character. The Yekaterinburg metro has a typical Soviet design with a triangle from three lines intersecting in the city center. Moreover, eight stations comprise 12.7 kilometers (7.9 mi) of length and are split due to deep and shallow areas. There are four pillar-trispans and one is a single vault using Kharkov technology. The deep-level stations have one pylon, one column and two Leningrad-technology. Although vault added to a design making it appear as a single deck. 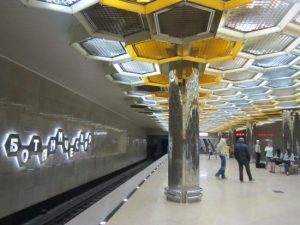 Like all other Soviet Metros, the stations are elaborately decorated, although in a more practical and modest decoration. In contrary to the Metro stations in Moscow and St. Petersburg, construction of the Yekaterinburg Metro just started in the 1980s. Moreover, the last station in this city wasn’t opened before the year 2012. Therefore, it is the last batch of metro station among other construction in Russia. There are 9 metro stations in Yekaterinburg Metro which are all modern and modest. The Uralmasch station has an amazing grey modern look with lighting that depicts modern art. The station is near the former Uralmasch machine facility. In addition, it is a large industrial and residential area with a train stop nearby. The station Dinamo (Динамо) is close to the Dinamo Sports Complex with finest marble decorations. Or another example is Ploschtschad 1905 goda (Площадь 1905 го́да) stations. The station is very spacious and grand. You would feel like being in a strange, giant palace. There are not many decorations here just a simple futuristic grey minimalist look. The architect of the Prospekt Kosmonawtow station really thought “futuristic” look like back in the eighties. It has an old futuristic atmosphere around the stations. One fact about Yekaterinburg metro is that these stations are a heavy fan of Ural marbles. You can see them in the floors and walls. Moreover, the same type of white marble also decorates other well-known-sights, like the Cathedral of Christ the Saviour in Moscow. Other material also uses the beautiful granite and Ural stones. Therefore, these stations have a range color of black, grey and white, a representative or modern look. All public transport costs RUB28 for a single ride, based on 2017 regulation. Visitors can buy tickets in ticket offices on any station. It uses a special card called Ekarta transport card which will work everywhere. Ekarta has lots of plans especially for unlimited plans for 3, 30 and 60 days. However, it is also useful even with the pay-per-ride plan due to the fact fare will be a couple rubles cheaper, than the cash one. Yekaterinburg Metro stations serve as a stop station for all trans-Siberian trains. The Sverdlovsk Railway Administration is located in the heart of the city. In addition, it serves trains on the territory of the Sverdlovsk and Tyumen Regions, the Khanty-Mansiysk, the Perm Territory, and Yamalo-Nenets Autonomous Districts. It also runs through as parts of the Omsk Region. However, The Perm–Yekaterinburg–Tyumen section is now also a part of the main route of the Trans-Siberian Railway. it is another reason to visit Yekaterinburg and enjoy the city. Yekaterinburg previously goes by the name Sverdlovsk or Enkaringburg. It is also the informal capital of the Urals. This majestic mountains between Europe and Asia offer many beautiful and mysterious sceneries. Moreover, there are many places in the Ural mountains that you can enjoy by taking the metro systems. The city grew rapidly because of its important industrial center and a transport hub. The city has uneven landscape. Moreover, stations in the city center are very crowded and dense. Another hand, stations in the outer city has a very deep or shallow feature. Therefore, the design requires many modifications to meet the city landscapes requirements. The deepest metro stations on the line are Uralskaja (Ура́льская). It has 42 meters in depth. Even when then city go through some economic situations, metro stations constructions never stop developing. Moreover, The President once diverted state funds to complete its construction. In addition, the city doubles the constructions and length in 1995. These facts about Yekaterinburg metro enhance the popularity of this city among Russian traveler. You can enjoy the beautiful Ural mountains main attractions, experience trans Siberian express journey and taste the amazing popular food of Yekaterinburg.